Disney has had its hand in numerous video game ventures in the past and in more recent days, including the Kingdom Hearts series, the Ducktales games, and plenty of other titles. 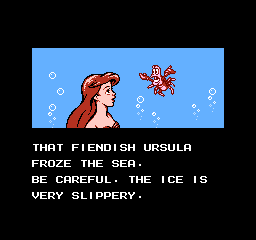 There are very few Disney movies that have not had some kind of video game treatment, and The Little Mermaid is no different. Plenty of these ventures have been successful and some of them, not so much. 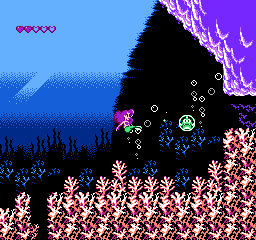 Where does Ariel’s adventure fall, and how does it stack up today? You’d think our noble heroine might be a little more surprised. e with Eric, a prince on the land. Once Ursula, the sea witch who granted her wish, casts a spell to control all of the fish in the ocean, she forsakes her legs and her man and goes back to the ocean to help free her former brethren. This is where the game begins. In short, if you’ve seen the movie, this is it minus the morals and fun songs (though ‘Under the Sea’ does play at the beginning and end of the game). The game’s mechanics are pretty simple. As it’s most likely geared toward children- and believe me, I tried to bear that in mind- the controls involve moving Ariel around the ocean and swiping your tail at the berserk sea creatures to capture them in bubbles and dispatch them. Continuing through five levels, you can find pearls in treasure chests to help improve your bubbles’ range and power, as well as doodads and knick-knacks to give you more points and therefore more lives. Simple? Simple. Again bearing in mind that this game is meant for children, its difficulty varies. In all honesty, I got bored and played through this game in about twenty or so minutes. I skipped over plenty of power-ups and other things that I knew would get me points. Some of the techniques needed for a few of the treasure chests were a bit beyond skills I would believe a child of this game’s targeting would have. It feels like this game ranges between way too easy and a bit too tough without much goings on in between. With the easy difficulty through most of it, though, I didn’t find it necessary to go through the tough puzzles. I think I’m more frustrated by that in retrospect than I was while I was playing the game. Don’t let their cute looks fool you. These guys aren’t all friendly. One of my favorite complaints about a game is ‘collision detection’ and while it doesn’t happen often, I harp on it when it does. I’m not sure if it was intentional or not as it only seemed to happen with certain creatures, but I found it frustrating when I could bubble something once and not seem to seal the deal with a second bubble because my projectiles would pass through. It may have been the creatures. I prefer to blame it on a hiccup in design. It resulted in a couple of hits I didn’t earn, and this kind of game, that’s kind of crummy. On the plus side, the game was relaxing. I don’t consider myself a ‘casual’ gamer by any means, but sometimes you just want to chill out and play through a game, and I did just that. The game was neat and compact and didn’t tax my brain or my skills. This game really does work as a fantastic ‘entry game’ for children. I can’t imagine playing through it at an age in the double digits with any serious investment. People I know who played it when they were younger have fond memories of it, though. Kicking fish around with your flippers… just like in the movie! w pops and even fewer memorable ones. The only bits of color I can really pick out are the ones from the ‘cutscenes’ (and that’s the best thing I can call them, honestly). The sound was saccharine. Upbeat and fun is fine, and most of the levels had such a tone. The music was enjoyable, and the boss music had the right tempo and feel for a Disney battle. At no point, even during the end fight, did I feel any sense of dread. Considering that I remember some amazing and frightening scenes from the movie, the game could have used some track that made you feel like you were facing more of a challenge. The sounds were cutesy, as expected, but considering how infrequently I heard them, I have to give them a par for the course, so to speak. If this review seems short, that’s because I went into this review with two guidelines: remember this game is meant for children and don’t spend more time writing this review than I did playing the game. It was a cute little game that I think strikes uneven ground for its target audience. While it has it’s fun nature, I definitely think Disney (and Capcom, obviously) put out much better and much more apt games than this one. I still can’t deny that I had a decent time playing it. I just didn’t realize how short that good time was going to be. 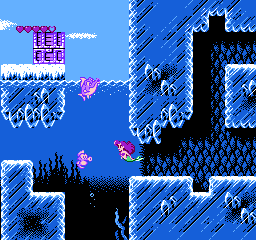 Didn’t know there was a Little Mermaid game, I always had a thing for Capcom/Disney games so I guess i’ll give it a go. I kind of forgot, too, but I remembered playing this when I was a kid and I’ve already had a few other people react to this with “oh yeah…” so it was apparently more popular than I realized. Hope you enjoy it!